Stunning Waterfront! 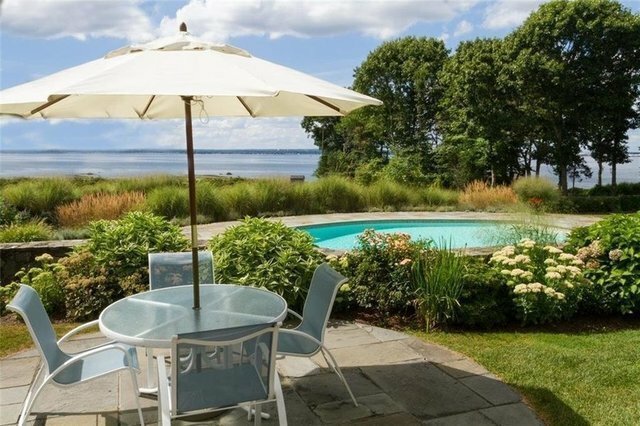 The West Passage of Narragansett Bay, with its sensational sunsets, makes a gorgeous backdrop for this beautiful stone and shingle-style New England residence, West View. Sited on 11-plus lush private acres with an amazing 525 feet of beach frontage, the property has an ambiance of an exclusive seaside retreat.West View is warm and welcoming while offering an open floor plan full of light, grace, and style. This coastal gem is custom built and architecturally designed with high-end finishes, beautiful hardwoods, custom cabinetry, high ceilings, and detailed moldings.The home offers four en suite bedrooms with 5,300 square feet of spacious living and dining areas, a great room and family room warmed by a stone fireplace, and a chef's kitchen. A den with wet bar opens to a rooftop deck perfect for entertaining or relaxation.A stylish screened porch overlooks the pool, bluestone patio with spa, and exquisite stone walls surrounded with perennial plantings, an awesome setting for warm intimate gatherings or for more formal entertaining. Enjoy peaceful walks on the beach, go treasure hunting for sea glass and shells, or explore the beauty of the Bay by kayak. At dusk, become mesmerized by the sensational sunsets. Additional amenities include outdoor shower, a sea-side shed, and a three-car garage. Plans for an additional three-car garage with an apartment are available. Indulge in the seaside lifestyle. West View is a perfect year-round home or summer retreat!